If you’re planning any kind of marketing activity, it’s pretty important to know what kind of return you’re going to get from it. Social Media is doubly hard, because it combines the creativity of traditional advertising with the accountability of digital. Assuming that you have a great message that you know will resonate really well with your audience, the question is, where to post it. Here’s some interesting stats about which social network is the best referrer of traffic. It’s immediately obvious that Facebook’s a bit of a dominant force here, as it should be: at the last count, it had close to 850 million users. At first glance, what’s a bit strange is the drop in traffic from Twitter. I think this line is a bit misleading, I’m guessing that the drop to 0 coincides with the time when Twitter started wrapping all external links in a t.co shortener which means that the referral traffic being recorded would no longer be twitter. Slap on the wrist to the data boys. First reaction is that StumbleUpon is incredibly powerful, however bear in mind that it is a network that is based purely on the principal of sharing content, and the primary engagement for most users is to move from one site to another. That’s not to say it’s not a great option for a traffic generation campaign, there is a good response when you get the message right, the only question is what kind of impact that traffic is going to have. Facebook is a comfortable second her, with around 3x the referals per user that Twitter has – gut feeling is that this is a result of the tighter social network element on Facebook – more detailed profiles mean that users have more in common. Twitter is in third place. I’ll be honest, I expected Reddit to have a bigger score than either Facebook or Twitter, because it’s a network based on sharing content, however that underplays the fact that Reddit’s primary engagement space is on the comments page. Perhaps users are more likely to discuss content rather than visit it. LinkedIn is also a relatively poor performer, however again, this is likely to be a result of the user behaviour on the site. Do people really use LinkedIn to discover great content, or is it more of a relationship tool? I’d go for the latter. The value of social traffic isn’t in doubt, and there is also no question that great content is more likely to be shared than bad content. The key message is probably still that Facebook rules the roost in terms of being the key focus of activity, however it is also worth remembering that no social network exists in isolation. People who use StumbleUpon for discovery of content will also share content elsewhere – with the current browser bars, you can tweet/like straight from the page you’re on. The same is of course true of all the different networks. People cross-post all the time. 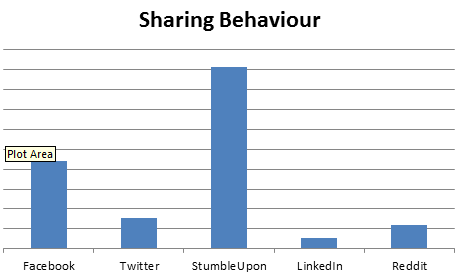 FB and Twitter are probably still the best bet as your primary share buttons, and you probably still want to focus on promoting the placement of them, however if you use a configurable sharing solution like Shareaholic, you might want to think about which networks you give the most prominence to. 3 Responses to Which Social Network Delivers the Most Traffic? 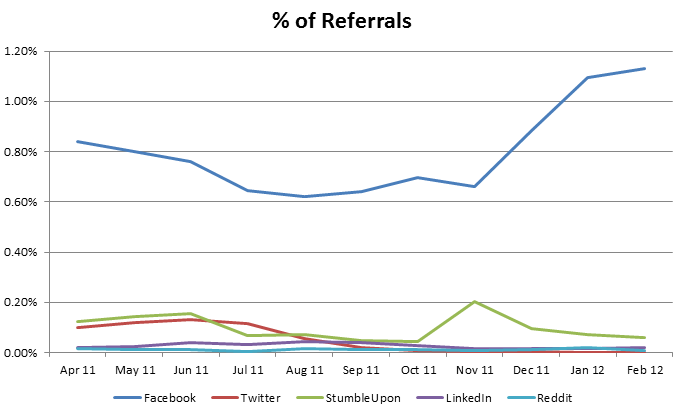 Good stats for the established networks, but where is Pintrest in all of this? I wasn’t able to get any data about Pinterest from the various sources I could find. Also difficult to get any consistent figures for Google+. TechCrunch stated that Pinterest had around 10 million users at the start of February, they’ve grown massively since then, however without any data about from Hitlslink or elsewhere, it’s hard to measure the benefits yet. If you asked me to go out on a limb, I’d suggest that user referrals from Pinterest sit somewhere around the Twitter/Reddit level, but that’s just speculation. I guess it depends on the content, doesn’t it?